Fresh-cut flowers in non-breakable container - one week. Decorations must not impede lawn maintenance. Please limit monument decoration to a total of two items (including floral arrangements). All decorations are left at your own risk. The cemetery does not maintain decorations. All worn, outdated, or excessive decorations will be disposed of. 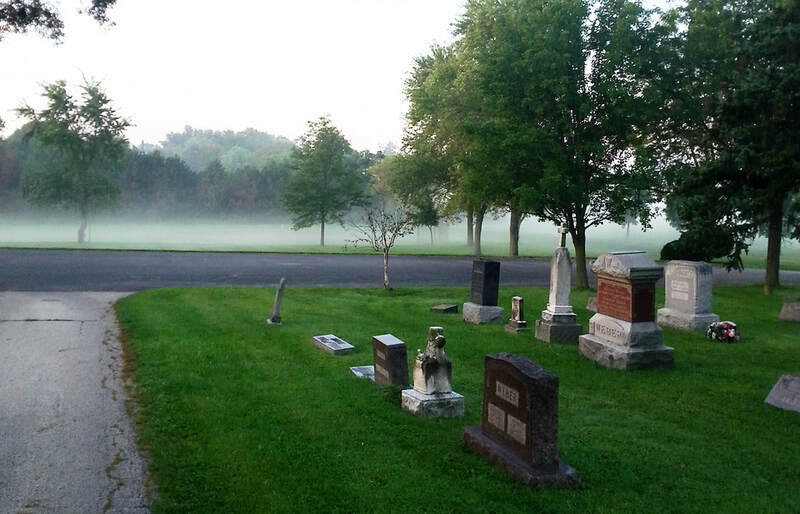 Cemetery visiting hours are dawn to dusk. Cemetery markers will be flat flush to the ground, no larger than one foot by two feet for a single grave and one foot by four feet for a double grave unless consent is given by the Cemetery Trustees. Markers are installed on and with a cement collar or a complete granite slab. There is a fee to install markers. All markers should be approved to verify names are in correct placement to graves. The cemetery is not responsible for wrongly etched markers. Cremation remains are to be enclosed in polyurethane, granite or non-breakable container. Visit your local funeral home or cremation services for approved containers. The approximate size of container is 10x8x8. There is a burial fee to intern or inurn cremains. Pets are welcome but it is the responsibility of the pet owner to clean up all animal waste.